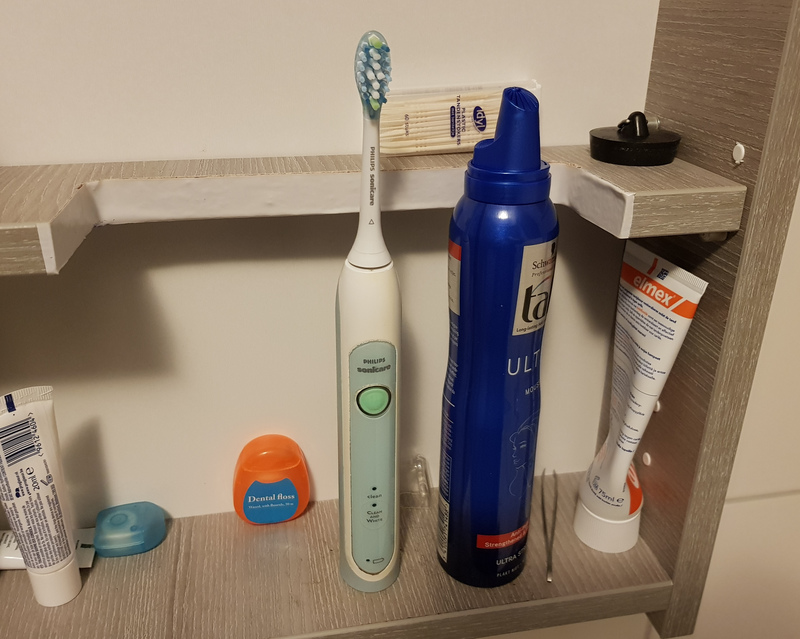 The shelves in my bathroom (mirror) cabinet do have fixed positions. 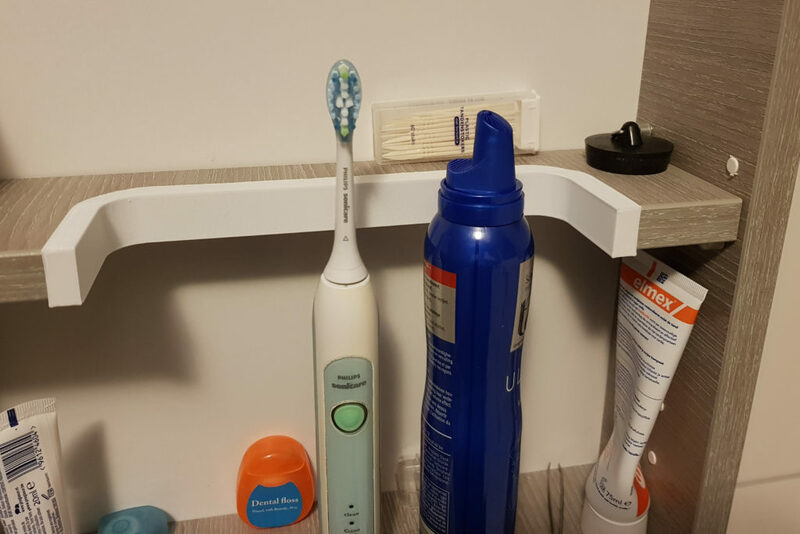 So when trying to put an electric (standing) toothbrush in there, it would not fit. So I just took out a bit of one of the shelves. And this left an ugly front side of the shelf, which needed some solution. Some tape, to hide the rough edge..
Of course this works fine (a bit shabby, but it’s juts a normally closed cupboard). 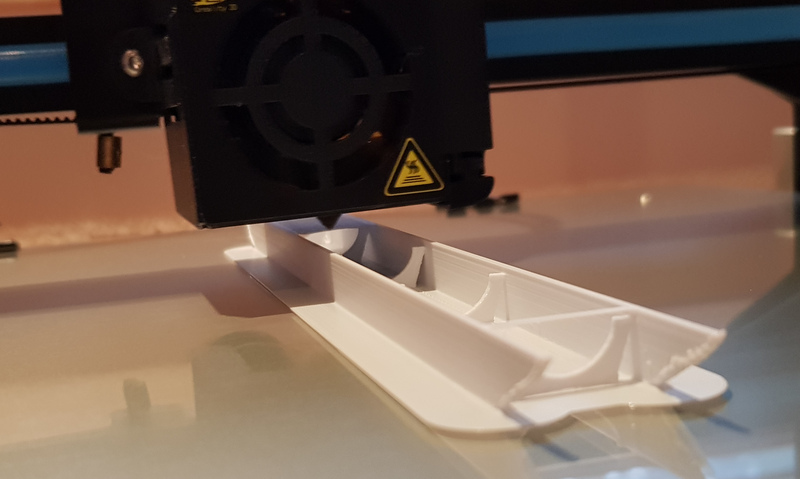 But as I did buy myself a nice (black Friday) 3D printer, last November, I thought I could do better 😉 So I took some measurements, to design a 3D U-profile cover strip. I took a cube, re-sized it to a 5 cm by 1 cm by 20,3 mm bar (see 1A in above diagram). Then took a second bar, a bit smaller (see 1B), used the Boolean modifier tool to remove 1B from 1A to get me a 5 cm long U-profile. 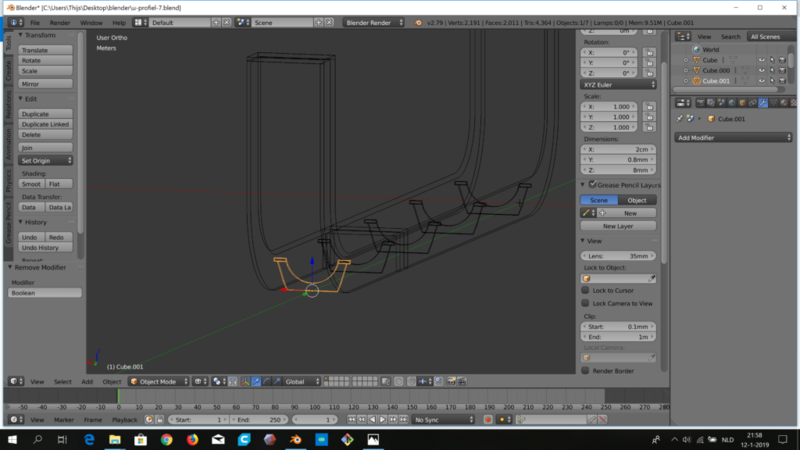 Then I used the “simple deform” modifier to bend it for 90 degrees (after first using the loop-cut-and-slide tool to add a whole bunch of segments to the U-profile, otherwise you do not get a nice bend). 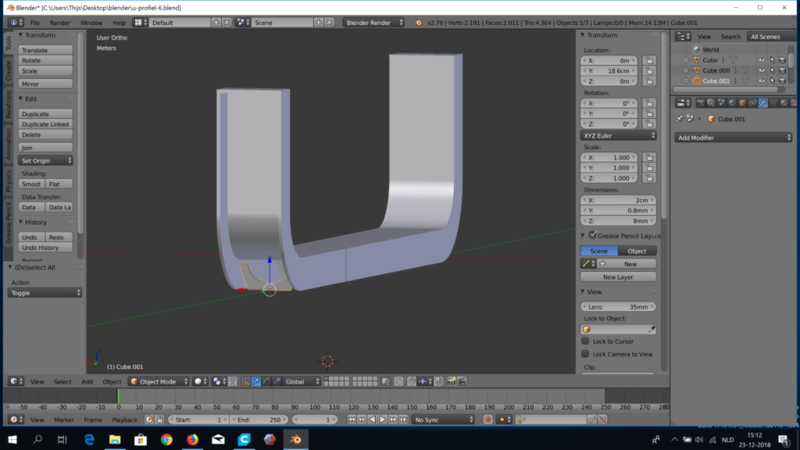 A simple copy/paste and mirroring to get a second bend U-profile. Connect and resize them by extruding the sides. And finally adding “end-caps” (just a thin rectangle to close the side). And to make it a single object, using the Boolean modifier again, this time not the “difference”, but the “union” of the objects. 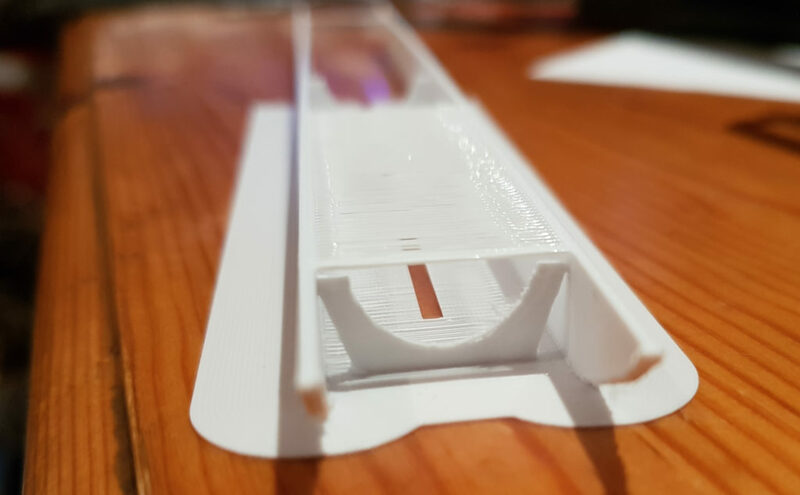 As I did not want auto generated support’s, I did change my design to contain some manual supports, little plastic pieces inside the U shape, to push the wall’s to the outside. In the hope this would prevent them from bending inwards. 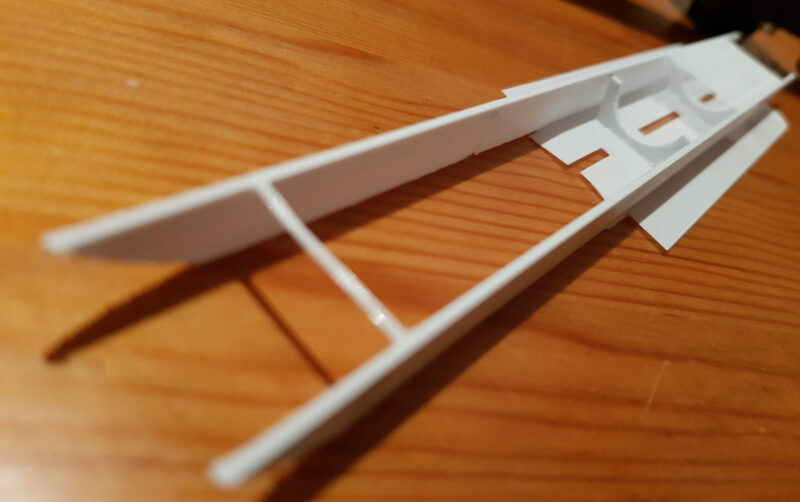 After printing, the extra pieces would have to be cut out. 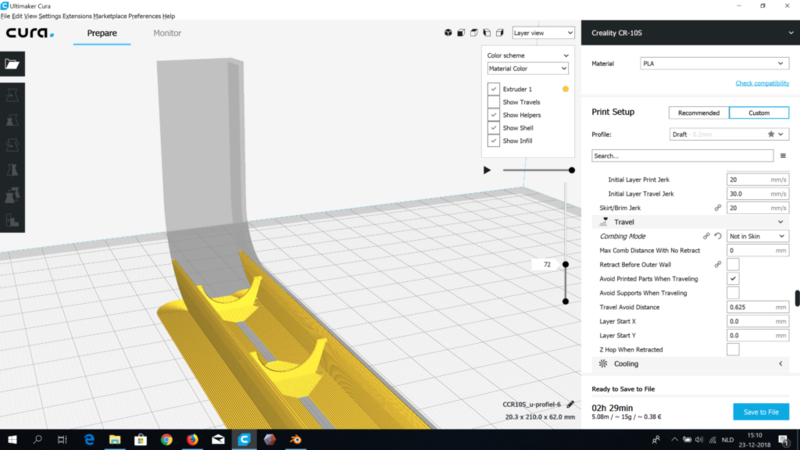 Layer preview in “Cura”, the “Slicer” software which converts 3D to print instructions. Top: half test of V2 – Middle: failed V1 – Bottom: completed V2. Conclusion: this was one of my first own designs. 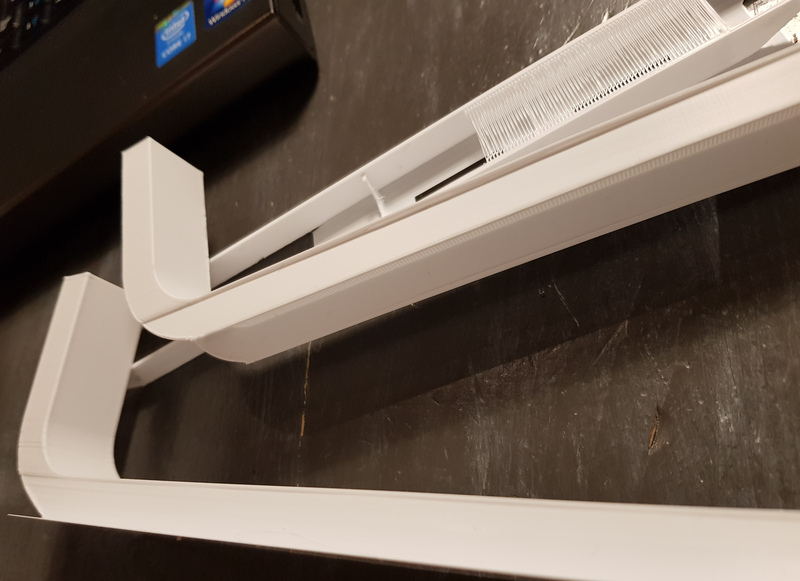 Points to keep in mind, 1 mm wall’s are quite thin, and break and bend easily. Sometimes you need to adapt your design to add custom supports. But I managed to get something designed (Blender has a quite steep learning curve), and get it printed in reasonable quality. Overall it was a nice little test project.